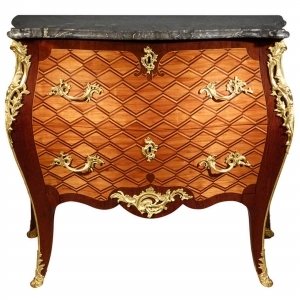 This rectangular lacquer cabinet is executed in black and gold reliëf lacquer. The hinged doors decorated with a teapot and a bonsai tree, opening to an interior fitted with ten drawers decorated with landscapes, the sides each with two birds on a branch. With gilt-copper mounts and on modern gilt-wood stand. 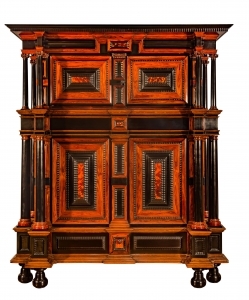 For a closely related but mirrored cabinet, also depicting a teapot and bonsai tree, see: Sotheby's New York, April 21, 1989, lot 249, illustrated. Japanese export lacquerware was one of the many goods that the VOC shipped from Asia to Europe. The lacquerwork was made in Japan for export and delivered in all forms, such as suitcases, trunks, boxes and cabinets. An important part of the lacquerware trade was formed by from so-called ' comptoirs ', or cabinets. A cabinet is a large, rectangular wooden box with a valve or two doors. Behind them a number of drawers to keep a bit of everything; jewelry, letters, curiosities, etc. 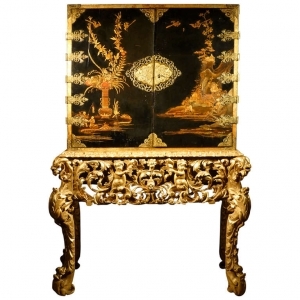 The casket and drawers feature Oriental scenes in gold lacquer on a black lacquered surface. All with rich decorated mounts. Usually a cabinet stood on a matching stand. These, however, are never made in Japan. Making Japanese lacquerware was fiddly, took a lot of time and was very expensive. 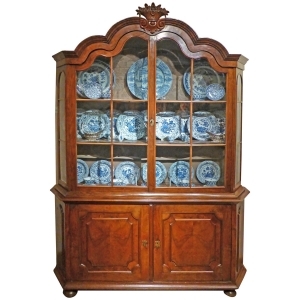 Eventhough the lacquerwork was popular, it did not bring the VOC much profit because of the size of the cabinets they took up to much space in the hold of the ship. The trade in Japanese lacquerware was therefore only a small part of the VOC trade with Japan. It was purchased on a limited scale, initially in Hirado and after 1641 in Nagasaki. Since then the trade went through Deshima, a small artificial island in the Bay of Nagasaki.